1. Gain an understanding of the air bag system and components. 2. Gain an understanding of when an air bag should or should not deploy. An introduction to air bag systems and inflation processes will be followed by a brief history of crash sensors. 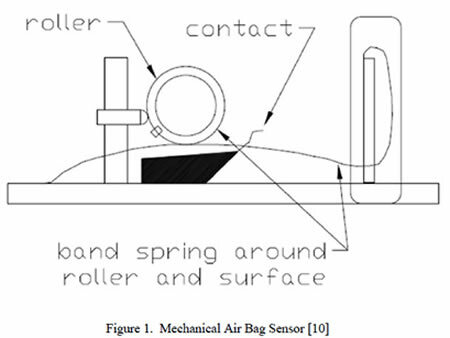 Variables used in air bag deployment algorithms will be described, and examples of several patented systems compared. A method to estimate the range of speed, deceleration, or displacement thresholds for air bag deployment will also be provided. The purpose of the air bag is to provide a cushion between the occupants and the vehicle's interior. For air bags to be effective they have to be fully inflated in a short amount of time, before the occupants make contact with them; however, this rapid inflation can potentially cause fatal injuries to certain people if they are in contact with the air bag during its inflation. Therefore, air bags must have a control system that can recognize a crash correctly, and early enough for the air bags to inflate safely. Air bags inflate after an electric current from the air bag control module is sent to a detonator. This ignition starts a chemical reaction producing nitrogen gas which rapidly inflates the nylon fabric air bag. The deployment and inflation process takes approximately 0.04 seconds . After full deployment, as the occupant impacts and compresses the air bag, the nitrogen gas is released through small vent holes. The holes are specifically sized and spaced to reduce the volume of the bag at different rates, depending on the type of vehicle. The gas is released along with dust particles from material used to lubricate the bag (typically talcum powder and cornstarch). Early air bag deployment systems in older vehicles utilized mechanical sensors for crash detection, which were phased out of the US market around 1994 . Early mechanical sensors, such as the "rolamite" by Sandia National Laboratories, relied on a metallic sphere that was stabilized at a standby position by a spring or a magnet (see Figure 1). When the sensor was subjected to a force beyond a designed threshold, the spring or magnet could no longer keep the metallic mass in place. The mass moved and made contact with an electrode, sending an electrical signal to the air bag control module, which then sent a signal to the air bag control module. Systems with mechanical sensors were generally inaccurate at interpreting minor collisions. Movement within mechanical sensors can be underrepresented with frontal collisions, and the acceleration the sensor experiences are sometimes slightly delayed. As an improvement, modern air bag deployment now relies on microelectromechanical system (MEMS) components. Kenneth Alvin Solomon, PhD, PE, Post PhD is Chief Forensic Scientist at The Institute of Risk and Safety Analyses (www.irsa.us). His formal education includes a BS, MS, and PhD in Engineering and a Post PhD each from UCLA. (1971, 1971, 1974, and 1977, respectively). For the majority of his professional career he was a senior scientist at RAND (Santa Monica, CA) as well as faculty at the RAND Graduate School and Adjunct Professor at UCLA, USC, Naval Post Graduate School, and George Mason University. He served as a Professional Service Reserve with two police agencies and a Police and Safety Commission. Dr. Solomon and his staff are engaged in Forensic studies primarily concentrating in accident reconstruction, biomechanics, and x factors.